Ebisu is a relatively famous area of Tokyo. It is next to Shibuya and close to Roppongi. It is known among locals as a hip place to eat lots of good food. The area is named after a famous Japanese beer, Yebisu. Both are pronounced the same. The true origin of Ebisu is from the name of one of the seven gods of fortune. He is mainly the god of fishermen and is always pictured with a fishing rod and fish. He is also the god of luck, working men, and the health of young children. Yebisu beer, itself, is also named after this god. Many people outside Japan don’t know of Yebisu beer as it’s not famous outside Japan. It is considered a major craft beer, and it’s priced that way as well. Yebisu beer is a very good beer, and highly recommended if you are in Japan. 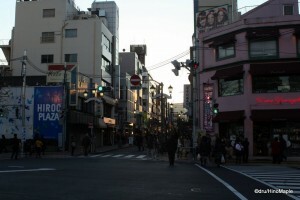 While Ebisu itself is a fairly large district, there aren’t many things to see or do. 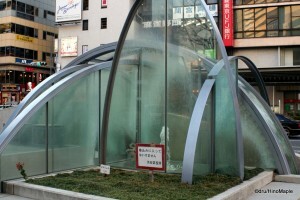 Heading South of the station, along the Yebisu Skywalk, you will reach Ebisu Garden Place. It is a wonderful area that provides many photo opportunities. Mitsukoshi department store is the major tenant of the area, and there are many interesting shops. However, don’t expect anything different compared to other department stores in Tokyo. The main attraction has to be the Yebisu/Sapporo beer museum. Yebisu is actually owned by Sapporo Breweries, and this is the only beer museum within Tokyo itself. The tour itself isn’t spectacular. It’s a self guided walk in only Japanese. You don’t even see anyone brewing beer. The best part is the sampling. You can get relatively cheap beer (compared to a bar). The best is the tasting set, 4 small glasses of beer. If you want to try Yebisu beer, but don’t know which one is best, this is your best option. Try them all! Aside from Ebisu Garden Place, there isn’t much to see. Ebisu has nothing more to offer than a plethora of restaurants. Anything you want to eat can be found here. If you choose any direction from the station, you are bound to find several good restaurants. East of Ebisu, you will reach Hiroo. I don’t advise walking there as there aren’t many signs and you are bound to be lost. 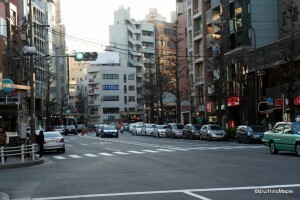 Hiroo is a quaint little town that is very expensive to live in. Hiroo is home to several embassies, and with it comes many foreigners. It’s very akin to Roppongi, but without the seedy nature. Shopping is mainly restricted to small boutiques, and so is eating. It can be difficult to find a reasonably price meal. The nice I would generally skip this area, but some people enjoy walking around various districts in Tokyo. The plus side of walking in this area is that it is very quiet and peaceful. There are also a few nice places to sit, relax, and have a nice cup of coffee. Heading West of Ebisu, you’ll reach the fashionable district of Daikanyama. It’s a very easy walk, but like all areas of Ebisu, you will more than likely get lost looking for it. It’s a very hip area that has many young fashion brands. You are likely to find rare pieces of clothing and several high end shops at the same time. This area is famous for the rich and famous. They do a lot of shopping, and it’s your best chance to see them on their days off. However, if you don’t know any famous Japanese stars, you would probably walk right past them without knowing who they are. Daikanyama is also home to Evisu jeans. 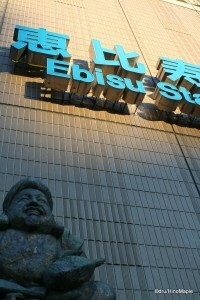 While they were founded in Osaka, they were also named after the same god, Ebisu, as the beer and the neighbourhood. It’s fitting that they have a shop or two located just outside Ebisu itself. Depending on what you are looking for, and how long you are staying, Ebisu and the surrounding areas may be an interesting place to see. However, I don’t recommend it for everyone. If you are looking for something unique, Daikanyama is a good place to go. If you want good eats, Ebisu is great. If you are just looking for a place in Tokyo where the old meets new, Ebisu is good, at the moment. Beware that Ebisu is growing extremely fast, and all the old shops that gave it character are slowly being demolished for large new buildings. This entry was posted in Tokyo and tagged beer, beer museum, Daikanyama, Ebisu, Ebisu Garden Palace, Ebisu Garden Place, Ebisu Skywalk, Ebisu Station, Evisu, Evisu jeans, fashion, god, god of fishermen, god of fortune, god of luck, Hiroo, Japanese beer, jeans, Mitsukoshi, roppongi, Sapporo, Sapporo Breweries, Shibuya, Shibuya-ku, tokyo, Tokyo-to, Yebisu, Yebisu Beer Museum, Yebisu Garden Palace, Yebisu Garden Place, Yebisu Skywalk, ビール, 代官山, 六本木, 広尾, 恵比寿, 恵比寿駅, 日本, 札幌, 東京, 東京都, 渋谷区 by Dru. Bookmark the permalink.